Graphic Design is an essential skill that you need to learn if you want to communicate visually to present, share and sell your work. For photographers, fashion designers, creative pros or small businesses, knowing necessary graphic design skills is vital and helps you present your work professionally. As an illustrator or artist, you may want to learn graphic design to supplement your professional skills. Or you may even want to become a professional graphic designer. Whatever be the case, there are lots of extremely affordable, and even free online graphic design courses available now for you to teach yourself graphic design on your own time and speed, without going to a graphic design school. We have researched and put together a list of the best free graphic design classes online that you can take up depending on your interest and goals. 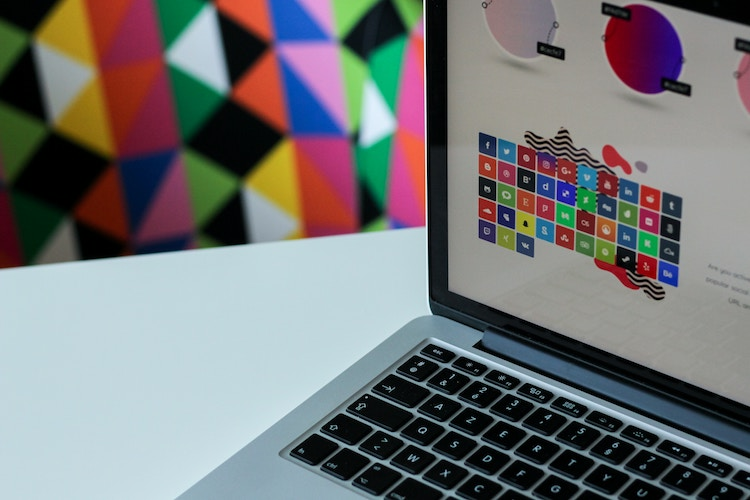 Starting from the basics of graphic design to typography, colors, composition and using design software, these courses offer all you need to know to improve your graphic design skills. And while you are improving your graphic design skills, don't forget to create your graphic design portfolio website to showcase your work. 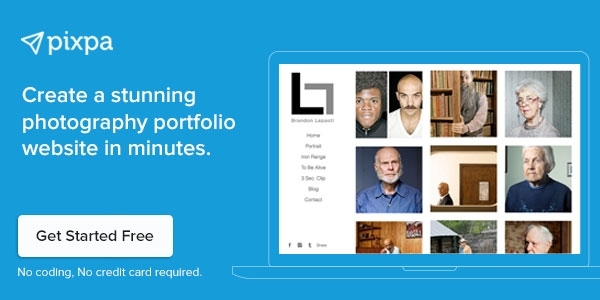 Here are some great examples of graphic design portfolios online for your inspiration. Skillshare has lots of in-depth graphic design tutorials available for free or through a subscription. 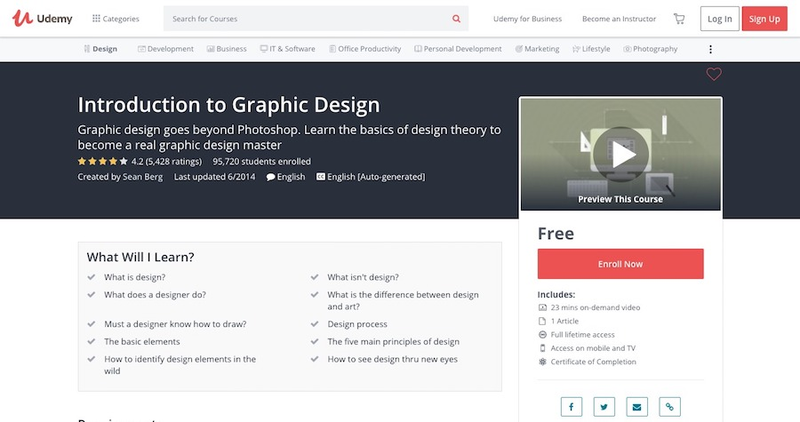 With a Skillshare membership, you can access all the courses at a very affordable price. Most Skillshare courses are by industry experts and include video content that makes them even more engaging. 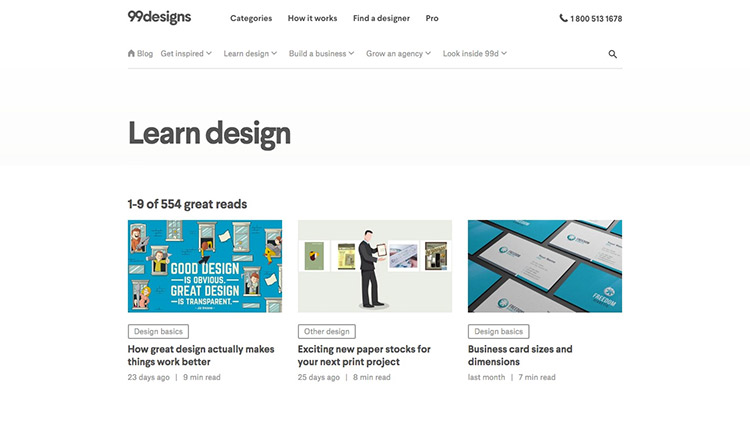 You can check out the various online graphic design courses offered on Skillshare at this link. Designers Ellen Lupton and Jennifer Cole Phillips present this excellent starter course that talks about the five core principles of graphic design. The 35-minute video class provides examples and demonstrations that you can use and apply right away on your design projects. Perfect for beginners looking to build a solid foundation in graphic design, this course teaches you how to apply graphic design principles in real-world projects like creating logos, marketing materials, and other design projects. Designer and Art Director, Mason Gentry presents this course in the form of critiques and reviews of logos, packaging, posters, book covers, motion graphics, websites, annual reports, environmental graphics, and editorial design. Through his reviews, Mason teaches about what makes a particular design work or fail. Why the designer made the design decisions that he did? How could the design be approached differently? It's an unusual way of learning graphic design, one that you would enjoy, especially if you are an inquisitive person who always asks the question - Why? Duke University, an Ivy League school in North Carolina has put together a resource that covers all the basic design principles. Its an excellent starting point with a lot of chapters that work like mini-classes. AIGA has a great article on the theory of graphic design which is an essential read for anyone trying to delve into the concepts behind the practical aspects of graphic design. Another course for the ones who love their history, this course takes you to the very beginnings of graphic design as we know it today. The course delves into the history of symbols and how handwriting developed. It presents a fascinating read on typographic milestones, a history of posters and books and the rise and fall of many of the graphic design movements like Modernism, Bauhaus, etc. This course on Alison is ideal for graphic design students or anyone interested in learning graphic design in general. This insightful course explores graphic design and the design process in general and gets deeper into design elements in specific, such as lines, shape, form and texture and design principles like composition, balance, contrast, and hierarchy. Alison.com also has several other free graphic design courses to help you build your skills at your own pace. 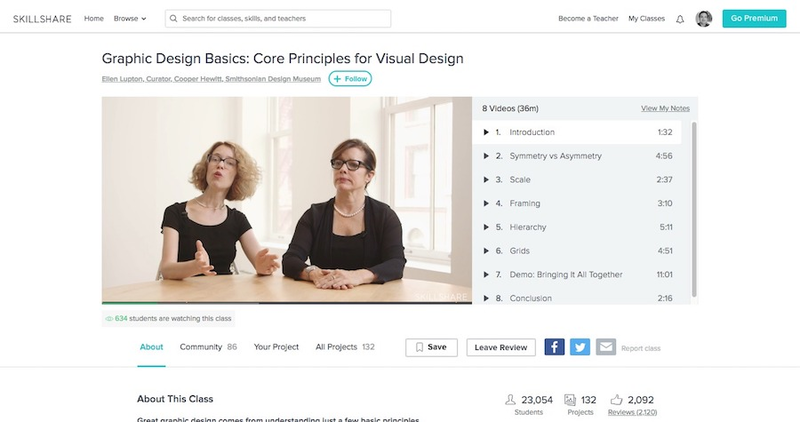 Designer, Sean Berg has created this course comprising of presentations and audio lectures that focus on answering questions such as what design is and what designers do. This beginner-level course aims at helping you understand the five fundamentals of good graphic design through exercises that demonstrate how these fundamentals get applied in the real world. If you are interested in going beyond Photoshop tricks and just learning the software, this course is a great foundation course that would engage, inform and excite you about graphic design. This free course on Udemy from Rawson Uddin has 7.5 hours of video content that explains the design techniques and components used to create many successful logos and how to use these principles to create your own logo. Playing with visual elements like texture, bevels, transparency, gradients, and shadows. Learn how to design a logo using Adobe Illustrator in this 3-hour long video course by Lindsay Marsh. In this course, Lindsay Marsh shows you the screen capture of her working on creating an actual logo in Illustrator and explains all the tools and processes that you can use to create a great logo in Illustrator from conception to the finished files. In the process, Lindsay explains the essential ideas and concepts behind designing a logo such as typography, colors, symbols, shapes, and styles. This 8 hours on-demand video course is a complete guide for learning Adobe Photoshop and is great for beginners and intermediate learners alike. The course structure gives a basic design introduction to start off with and then goes into detail on how to use the various Photoshop tools and features like Selection, manipulation tools, creation and workspace tools. The course also takes you through design principles, tips and tricks to help you get started in Photoshop. Canva is an online tool for creating basic graphics easily and quickly without using Photoshop, Illustrator or any other software. 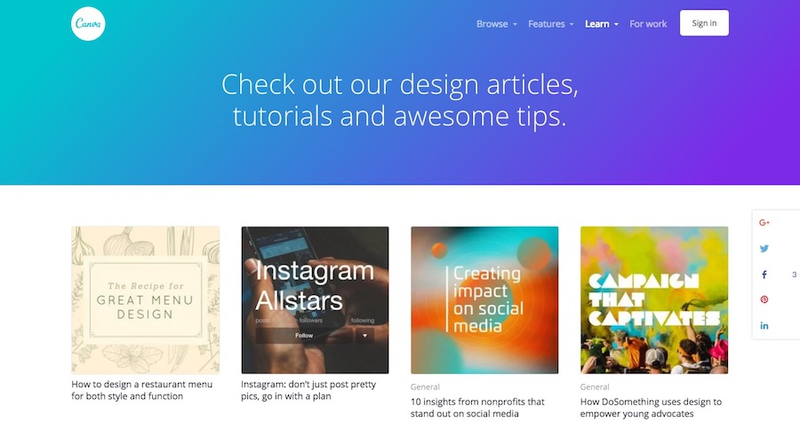 Canva also has a Canva Design School section on their website that offers several resources for beginners, intermediate and even experienced graphic designers. It has a new course on Creativity and one on creating graphics for Facebook amongst many others. 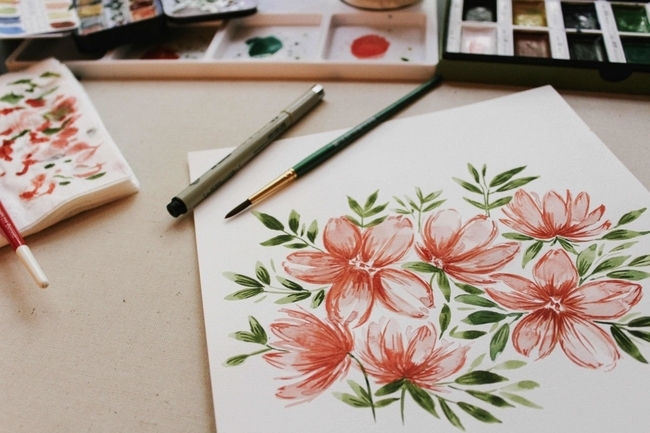 Canva offers a free online video course called Introduction to Graphic Design. 99 Designs is a great platform that connects graphic designers with clients and helps them generate new work. 99 Designs also has a great blog with tons of articles with inspiration and business tips for designers. There is an in-depth Learn section as well in the blog that has hundreds of tutorials and articles on masterering everything from color and typography to logo design and Illustrator. Envato Tuts+ offers over 851 hours of tutorials for designers that cover the whole gamut of topics, including Illustrator, Photoshop, Cinema 4D, Rhino, and many more. Tuts+ has a $19/month subscription that gives you access to hundreds of step-by-step tutorial videos on courses ranging from Adobe Creative Suite elements, coding, and web design. 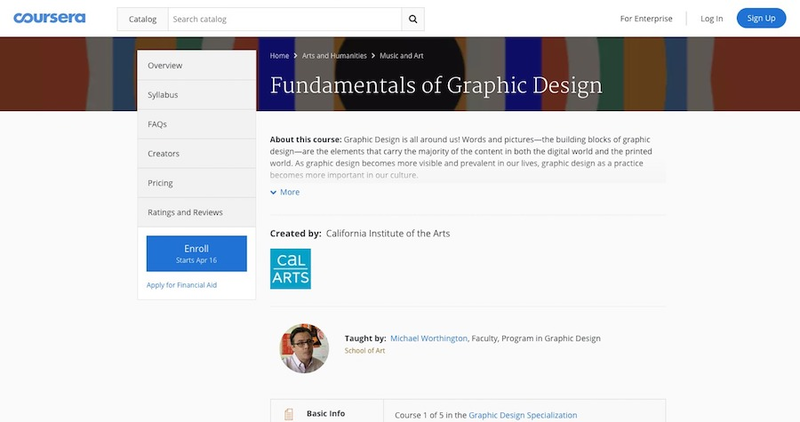 Coursera has a lot of online courses from some of the best graphic design schools such as Stanford and Yale that you can access for free. If you want your work reviewed and get a online graphic design degree at the end of a course, there is a fee. However, you can get the graphic design course material for free by choosing the "Audit this course" option. 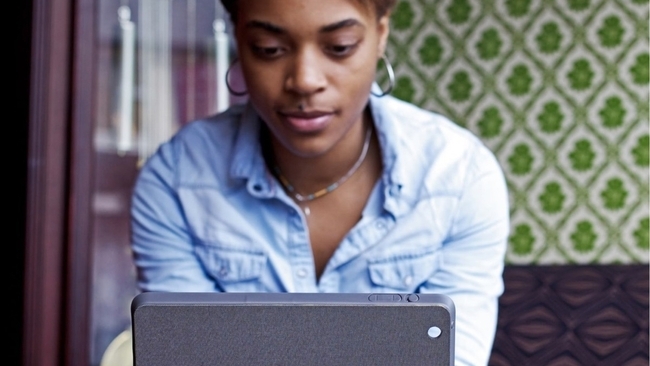 Check out the best graphic design courses offered by Coursera. This course taught by Louise Sandhaus and Lorraine Wild from the California Institute of the Arts is targeted at beginners and students interested in learning from and about the history of visual communication. The course traces the history of design and how it emerged as a recognized practice. The course also explains how designers approach specific design problems in their work and why things look the way they do. This 4-week course for beginners is taught by Michael Worthington, Faculty in Graphic Design from the California Institute of the Arts. This course uses visual examples to teach you the fundamental principles and foundational skills of graphic design: typography, composition, working with images, color theory and shapes. This course emphasizes hands-on participation and has many design exercises and practical projects that you can do yourself. Kadenze, like Coursera, provides courses on art, music, design and creative technologies. As in Coursera, you can choose the ‘Audit Course’ option to get access to the course materials for free. This 7-session, adaptive course taught by Brockett Horne and Ellen Lupton, authors and leading faculty at Maryland Institute College of Art (MICA) is targeted towards beginners. The course introduces the history of graphic design and answers questions like how did graphic design evolve as a discipline and what are the current and future design trends. The course covers everything from fonts and letterforms to posters and brands. You can also test your knowledge through short quizzes, and practice your design skills by taking up the creative exercises prompted in the course. This 5-sessions, adaptive course is taught by Junichi Tsuneoka from the Cornish College of the Arts, Seattle. The course focuses on how you can take your design skills and grow them into professional, marketable illustrations. This course will help you to explore how you can translate your visual ideas into high-quality illustrations. The course also delves through a series of projects into how you can develop your illustration abilities to produce and distribute illustrations. This course is for intermediate designers who possess basic drawing skills and have a basic understanding of how to use digital tool skills such as Adobe Illustrator or Adobe Photoshop, as well as an understanding of fundamental design theory. CreativeLive is an excellent resource that offers a range of online courses geared towards designers and artists to advance their creative skills. While many of the classes are paid, you can get good deals on many of them. There are a few free classes as well. 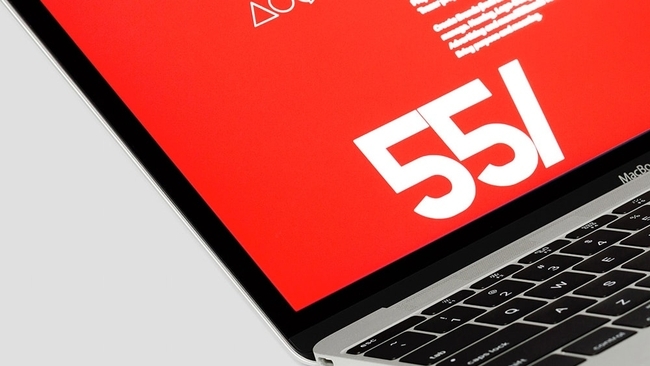 These online courses are taught live by professional instructors over the span of a few days and include HTML and CSS for designers, an introduction to typography, fundamentals of Adobe programs, and more. 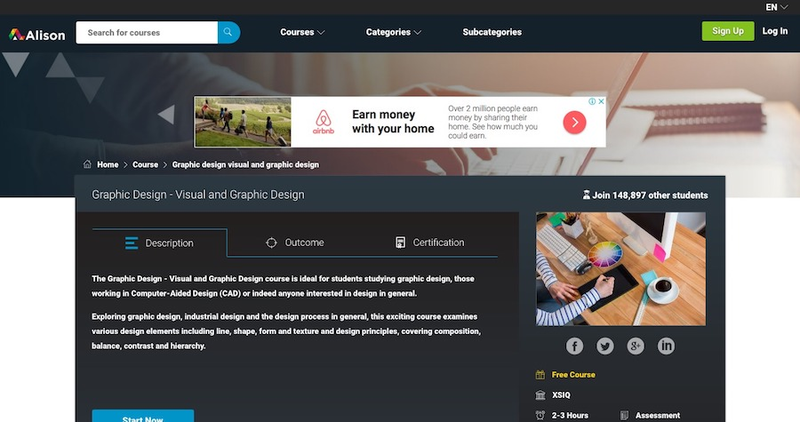 Lynda.com has hundreds of free courses in graphic design that you can choose from. There are paid courses as well that you can access for a small subscription fee of around $20/month. There is a free one month trial, which should be enough for you to access and study the top courses. With so many affordable options for online graphic design courses available, learning graphic design is easier and more accessible than ever. You do not need to invest time, money and resources to enroll in a full-time course at a design school and get a degree in graphic design to take up graphic design as a profession. For creative pros, it's a great opportunity to add graphic design skills to their repertoire, keep up with the latest graphic design trends and present their work professionally. So go ahead and pick an online graphic design course that excites you and get cracking at become a great graphic designer. 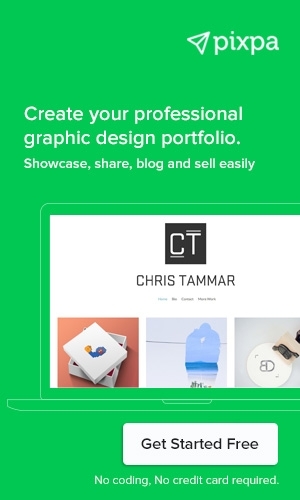 Create your professional graphic design portfolio website on Pixpa easily. No coding required. Start your free trial.